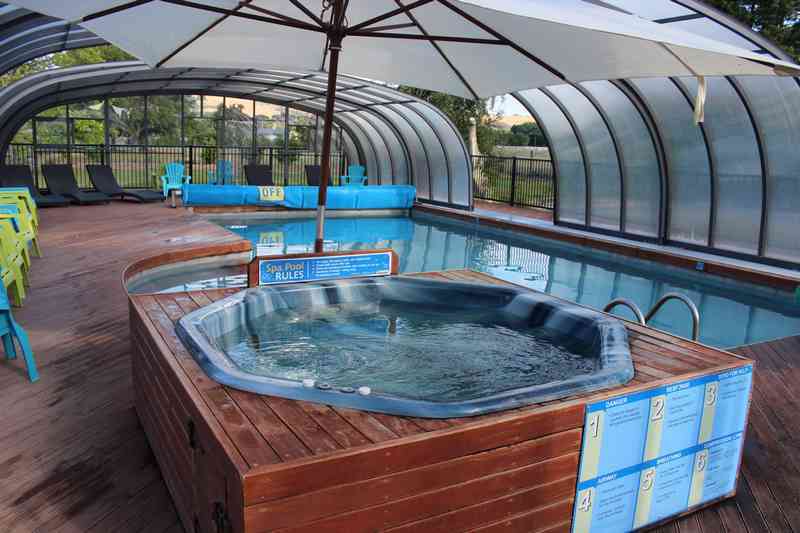 We have a fully enclosed heated swimming pool and spa complex. 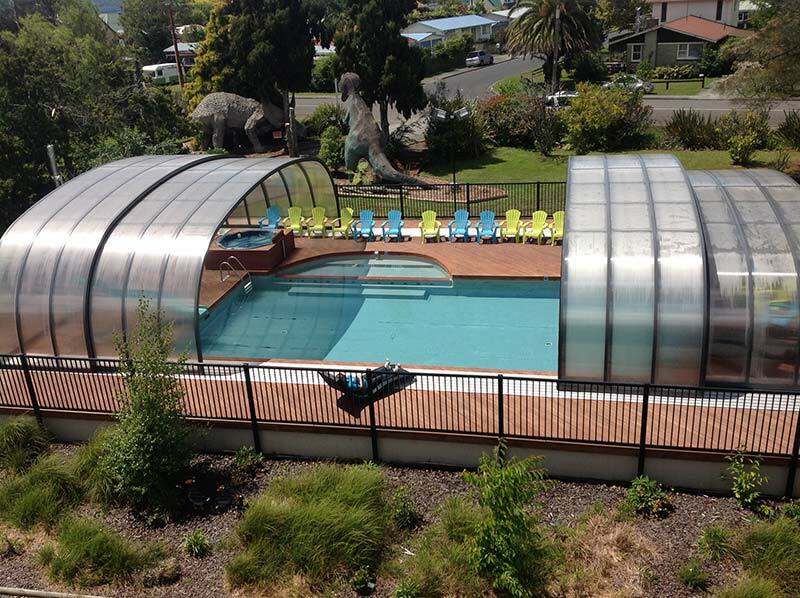 This allows for all year round swimming or just lazing on the deck chairs enjoying the warmth inside on those wet days. Now you can go swimming while on a winter holiday! Our pool is opened from 8am until 9.30pm 7 days a week, the only time it is unavailable to guests is WEEK DAYS between 3.40pm and 5.40 during school terms – this is when we help save children’s lives by letting our pool be used by instructors teaching children to swim. Our park kitchen has two full size ovens/stoves plus four sets of hobs, microwaves, toasters, instant hot water, fridge and freezers all available to guests at no charge, and of course the kitchen sinks! Our dining room has tables and chairs and an outdoor seating area. There is also a 42” TV with Sky (2 movie channels, 2 sports channels, and Disney channel), brochure stand, books and games. The internet kiosk is situated next to the dining room and takes $2 coins. 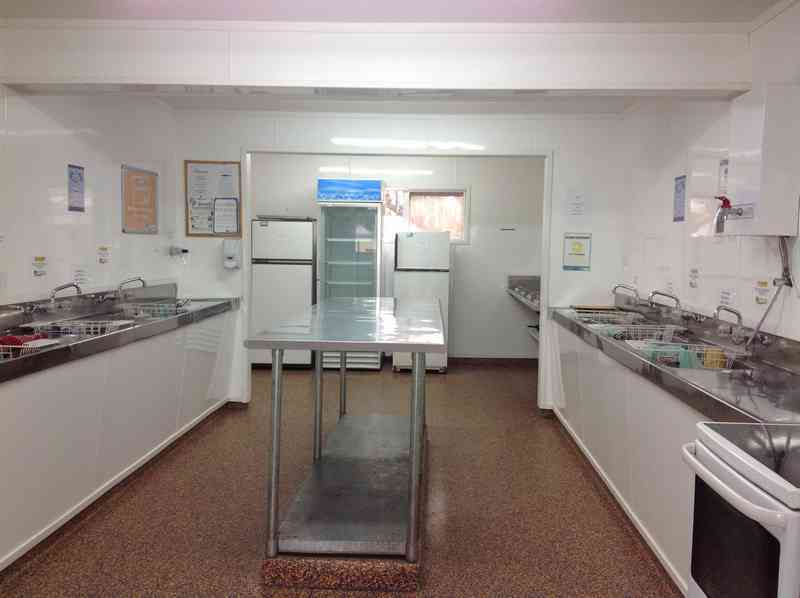 We pride ourselves on our modern and clean park amenities block. There is no extra charge for showers. The female shower block features a larger shower suitable for mother and toddlers, complete with babies’ bath and goose neck style shower head for convenience. 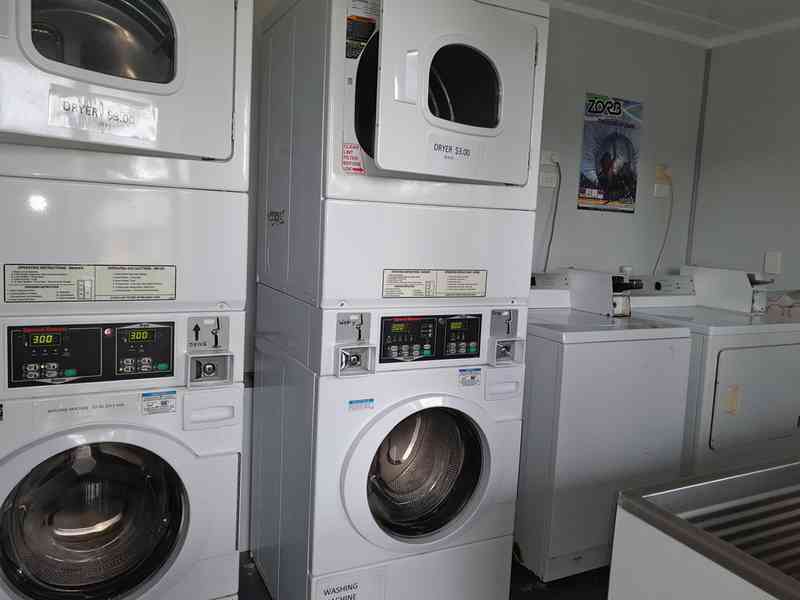 Featuring coin operated washers and dryers, $1 and $2 coins. Washing powder is available for purchase from the park shop. Use of the iron and ironing boards are FREE and clothes lines are provided through out the park. The park shop has an adequate supply of food, drinks, sweets and toiletries. There is a brochure stand with information on a range of activities in Rotorua at the reception area. Ask our staff as they are a wealth of information on things to do! We can also pre-book guests onto most attractions. Some operators offer a free pick up service (talk to our staff for more details). The children’s playground is conveniently located in view of most accommodation for easy supervision. The playground has numerous activities including, slide, poles, climbing racks, boat, tree huts, swings, trampoline, hop-scotch stones. There is an under 10 year age playroom with cartoons etc. We have 18 dinosaurs spread around the park, and 4 bouncy castles which are put up for school holidays and Christmas holidays. We offer a free start WIFI. Should you need more Wi-Fi there is an Internet Kiosk, which includes Skype and CD burners in the lodge building that is open for all guests. The kiosk runs on a “pay as you go” system. 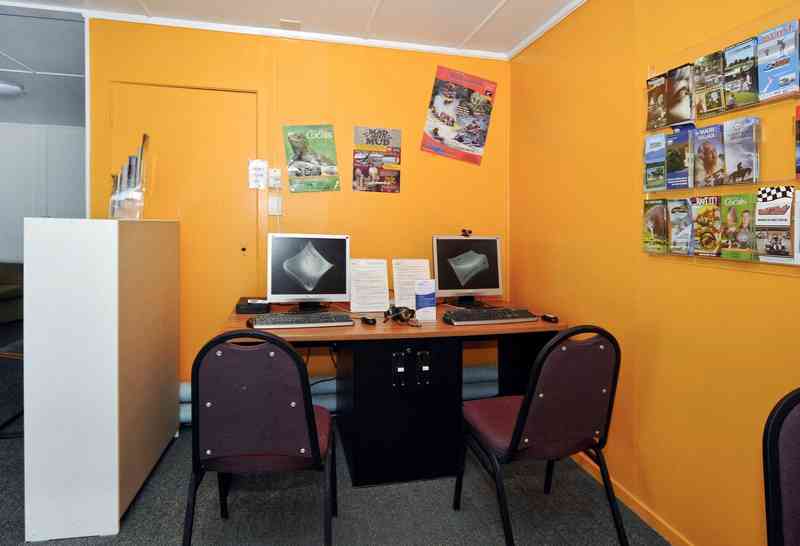 We also have wireless internet access throughout the holiday park and prepaid cards can be purchased from the park shop. All Seasons Holiday Park – Rotorua has a Qualmark Bronze rating for our ongoing work toward substainability and we use recycle/reuse/reduce policies. All Seasons Holiday Park – Rotorua has recycling stations on site for all your plastic bottles, cans and other recyclables. By using recycling you are doing your bit to keep the Rotorua district clean and green. Monitoring of energy comsumption to identify any abnormal comsuption and quantify energy savings. Encouragement of employees to identify and implement energy saving practises usch as resetting heating, air conditioning, refrigeration to fixed tempatures when cleaning rooms and not leaving equipment such as TV’s and heated towel rails on standby. Use of more efficient lighting in the ablution/kitchen block. The use of sensors and timers to turn off lighting in common areas.